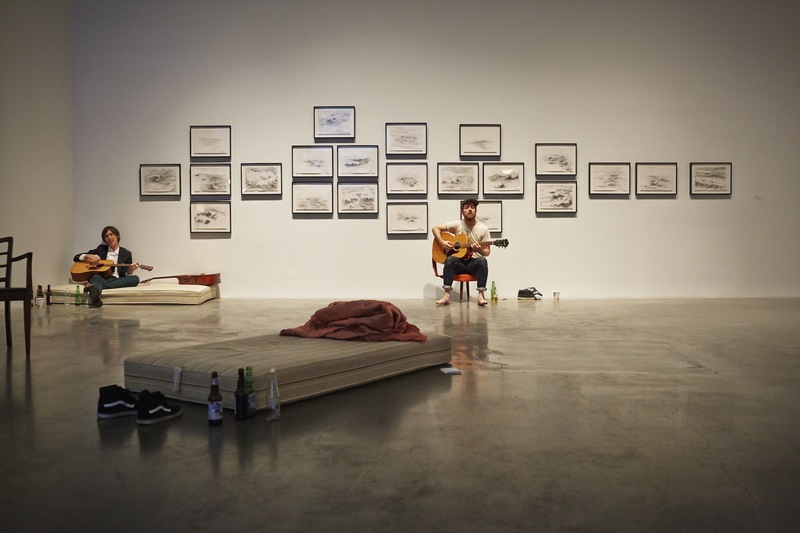 Ragnar Kjartansson may actually be one of the most important artist’s of our time. That’s right, you’ve read correctly. 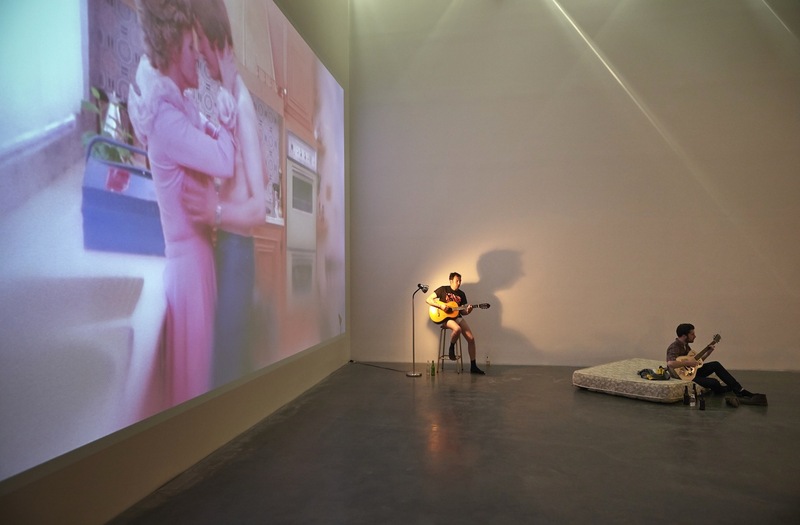 Kjartansson, born 1976 in Reykjavík, Iceland hasn’t limited himself to a particular media and in keeping his toolbox open, offers a brand of contemporary art that cannot be loosely defined. Since his well received “Bliss“ at Performa 11 (2011) at Abrons Art Center in New York, he has had several other live performances that all have required time, an audience, a plan and a soundtrack. Working with Kjartan Sveinsson, a former member of Sigur Ros, Kjartansson has composed songs that are performed, whether by voice or instrumentally, in duration and repeatedly, become something other than what they appear/seem to be. In 2013 alone, he worked with the rock group The National at MoMA PS1 “A Lot Of Sorrow” (2013) and Kjartan Sveinsson for “S.S. Hangover“ (2013) a performance at the 55th Biennale di Venezia. While a song is usually around 2/3 minutes he occupies the surrounding, chosen space of a particular venue and invisibly, expands into every nook and corner. Sound carries and not only within the confines of a walled interior, but also within the mind’s eye of the visitor and all of those present. The sound he chooses to brandish is never a pop song nor a jingle but rather something that forges its way into the emotional landscape accessed only by way of memory, melancholy, love and loss, the kind of feelings that everyone can relate to which often have their own chose soundtracks. Time can often be measured in song. Sound can be traced through experience, movement and tactile association. Something felt can also be revealed by the consummate realization of semiotics. Utilizing performance in a completely non-didactic way, these works allow for the viewer to insert his or her personal conjecture as a way to define or frame what is being experienced and/or felt. Not unlike models posing for a restless painter, Kjartansson’s characters move within the confines of their determined canvas while he conceptually paints the scene, specifically through the eyes and ears of others. 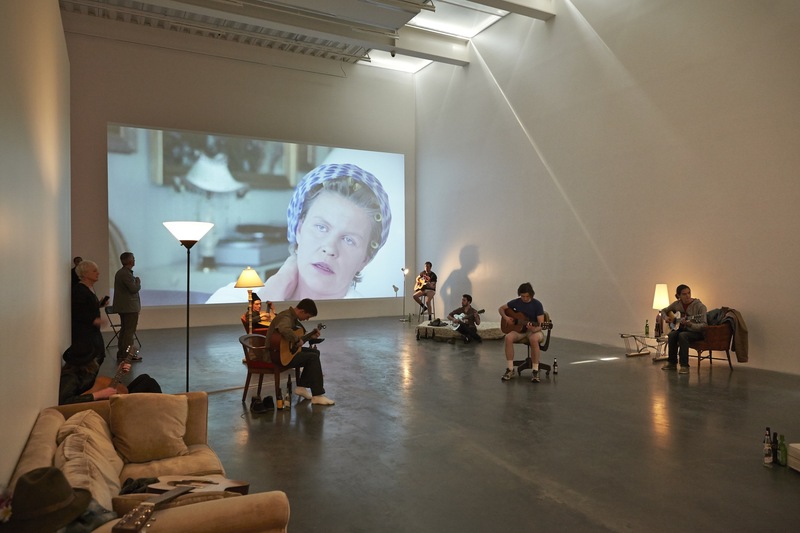 For his solo exhibition at the New Museum titled “Me, My Mother, My Father and I”, the artist has recruited 12 performers who walk around the 4th floor gallery singing acoustically, some strumming on guitars. Nothing is plugged in except for a refrigerator housing bottles of beer and water. Each day, during scheduled museum hours, the performers remain within the realm of the gallery, but can roam within this particular environment, each step carrying the possibility of altering a pitch, a head turn may affect the way that a voice responds in relationship to the proximity of a wall or distance from the ceiling. A few bare mattresses are strewn around along with several chairs and a couch. Lights are set low (dimmed) and walking into the gallery is at first as if walking into someone’s sparsely furnished practice space or living room. Mom (housewife): This is it. Dad (plumber): Is this it? Mom: Yes, this is it. Do you think it can be fixed? Dad: Yes, I am afraid so. Dad: Don’t you worry now, I’ll fix it. Mom: Show me what you can do! Mom: Are you a man? Show me what you can do to me! Take off my clothes! Take me, take me here by the dishwasher! It is these nine lines, that have been put to music and are sung in a round, the first line and last line lyrically overlapping. At first it is difficult to decipher or identify particular words, following a score, emphasis is placed on sound rather than meaning. “Take…..take me….by the dishwasherrrrrrrr” carries through the elevated ceiling, clear and crisp voices echoing in the scripted desperation, that eventually lead to the conception of Ragnar himself, the real-life couple, who according to family legend, conceived the artist the very next day after filming this very scene. Tapping into the mythology of one’s own inception is the cornerstone of the work, providing both an interlocking dialogue between life and death. Here, the edited film clip plays on loop, the same loop that fills the gallery in sound, once, twice, hundreds of times. Time is required to fully appreciate the sculpture for what it is and for it to occupy space in the interior of your mind. It is a work meant to be carried, meant to be unknowingly hummed and if at it’s best, passed from the lips of one to another, on the streets on Manhattan, where the closest ceiling is the sky. Performers include: Mike Bono, Turner Cody, Graham Corrigan, John Dydo, Jackson Fitzgerald, Kenji Herbert, Kevin Johnston, Miles Joseph, Asher Kurtz, Robert Leslie, Grady Owens, Kirk Schoenherr, and Max Zuckerman. Courtesy of the artist, Luhring Augustine, New York and i8, Reykjavik. The exhibition opened to the public May 7th and will close June 29th, 2014 and was curated by Massimiliano Gioni, Associate Director and Director of Exhibitions, and Margot Norton, Assistant Curator.